Perhaps the most theatrical aspect of the recent government shutdown was the feud between President Donald Trump and House Speaker Nancy Pelosi over whether, when and where the President would give the annual State of the Union Address. Along with all the drama, it shows how poor relations between the President and House Democrats are, and it portends a very unproductive 116th Congress. In the midst of the government shutdown, Speaker Pelosi sent a letter to President Trump to “suggest” that they reschedule the State of the Union they passed appropriations to fund the government. The following day President Trump sent the Speaker a letter informing her that he ordered the military not to provide support for her and other lawmakers’ trip to Brussels, Egypt and Afghanistan. The following week, Trump reiterated his intention to deliver the State of the Union from the House. Speaker Pelosi responded by sending him a letter informing him, “the House of Representative will not consider a concurrent resolution authorizing the President’s State of the Union address in the House Chamber until the government has reopened.” While he initially suggested he would find a different place to give the speech, President Trump conceded that he would wait until the government is reopened so he could deliver it in the House Chamber. As of now, the government is reopened, and Speaker Pelosi has reissued an invitation for the President to address Congress a week later than planned. Even though the speech is back on, this episode serves to illustrate just how fraught the relationship between the President and the House majority is. When the President gives a State of the Union before Congress, he is doing so on the Legislative Branch’s turf. The joint session is a formal, official meeting of the two Chambers, and their protocol is that they adopt a concurrent resolution, a piece of legislation that must pass both Chambers but does not go to the President for a signature. Concurrent resolutions are used to manage the internal affairs of Congress when the two houses must act together. They are used for things like setting a time and date for joint sessions (such as a State of the Union) or for setting a date for an adjournment of one or both houses for longer than three days (the Constitution forbids one house from adjourning for more than three days without the concurrence of the other). The House and Senate treat concurrent resolutions to receive communications from the President as privileged, so they take precedence over other legislative business. The privilege that the concurrent resolutions enjoy suggests that Congress deems such messages from the President as very important. Yet, at the same time, both Chambers need to adopt such a concurrent resolution, so the President cannot simply presume that he can address Congress in the time and manner that he desires. If congressional leaders block a concurrent resolution or if a Chamber defeats it, the President would be out of luck. Resolved by the House of Representatives (the Senate concurring), That the two Houses of Congress assemble in the Hall of the House of Representatives on Tuesday, January 30, 2018, at 9 p.m., for the purpose of receiving such communication as the President of the United States shall be pleased to make to them. Normally, they are adopted by unanimous consent without debate. For instance, according to Congress.gov, adopting the 2018 concurrent resolution took all of one minute in the House. 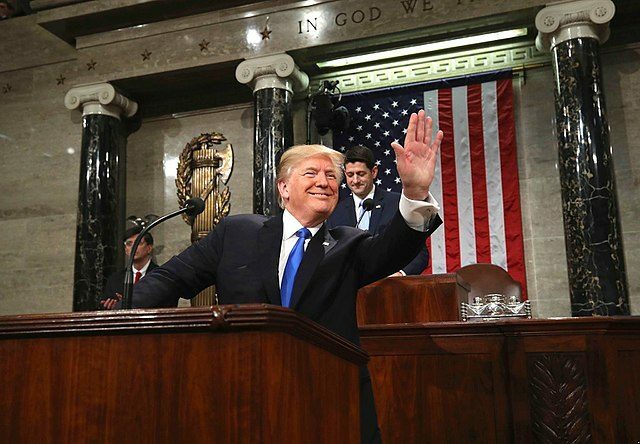 Over the last century Presidents have delivered the State of the Union in person, but it does not appear that there has ever been such a serious brouhaha over the speech. This includes the many Congresses when the White House and the House have been controlled by two different parties. In 2018, several Democrats decided not to attend the speech, and it’s highly likely even more will boycott this year, when it is finally scheduled. The second takeaway from the State of the Union squabble reinforces the first: The exchange between the President and Speaker is a reminder of the potential power the Speaker has, especially when she opposes the President. Speaker Pelosi unilaterally derailed the President’s plan to give the State of the Union in the House Chamber. It wasn’t just that she sent him a letter uninviting him to the House, she noted that the House would not consider a concurrent resolution to hold the State of the Union. This points to her vast power to set the House’s agenda. If the Speaker does not want something to come to the Floor, she can block it. President Trump’s plans will go nowhere in the House without her permission. Perhaps it should not be entirely surprising that the State of the Union was caught up in the fight between the two branches of government and the two parties. Both President Trump and Speaker Pelosi are known for their blunt tactics and determination, and the issue at stake here, the border wall, is one of the most divisive in modern politics. They will assuredly have an interesting relationship over the next two years, to say the least. And the 116th Congress is not even a month old yet.